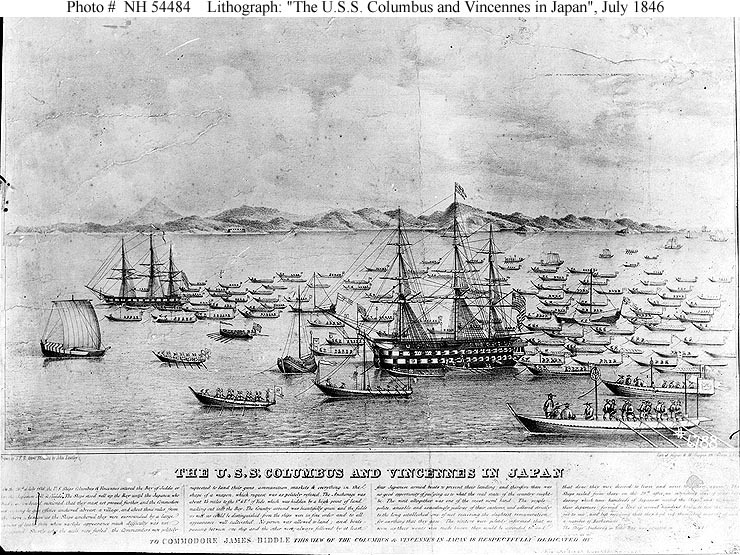 ◎First ship raise the "Stars and Stripes," 4 Jul 1777. 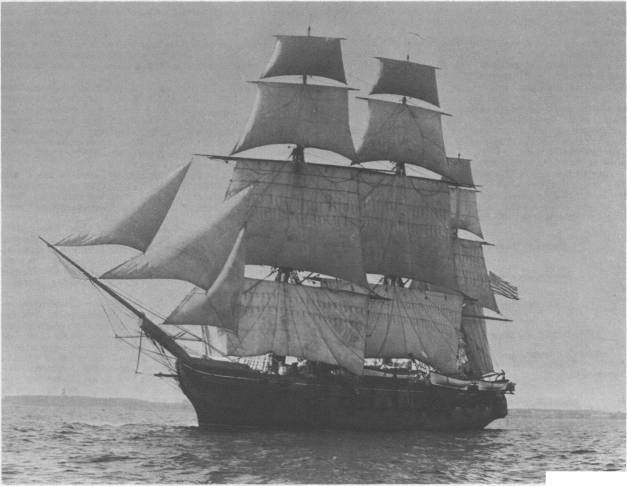 Sailed for France under J. P. Jones, 1 Nov 1777. 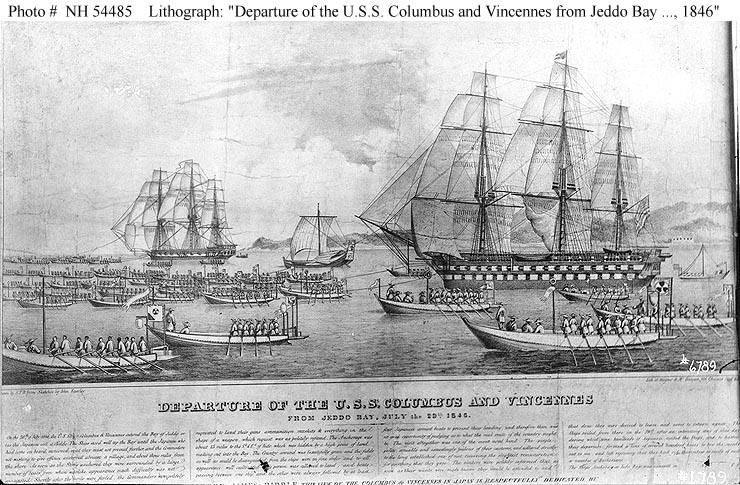 Received first official salute to an American warship in Europe in Quiberon Bay, France, 14 Feb 1778. Attack on Whitehaven, England; took sloop HMS Drake, 14, off Carrickfergus (2 killed), 24 Apr 1778. ◎Action with brig HMS Keppel, 9 Mar 1780. Disappeared at sea off Cap Francais, West Indies, after capturing two ships, 15 Mar 1781. ↑USS Boston. Painting by Rod Claudius, Rome, Italy, 1962. It was made for display on board USS Boston (CAG-1). 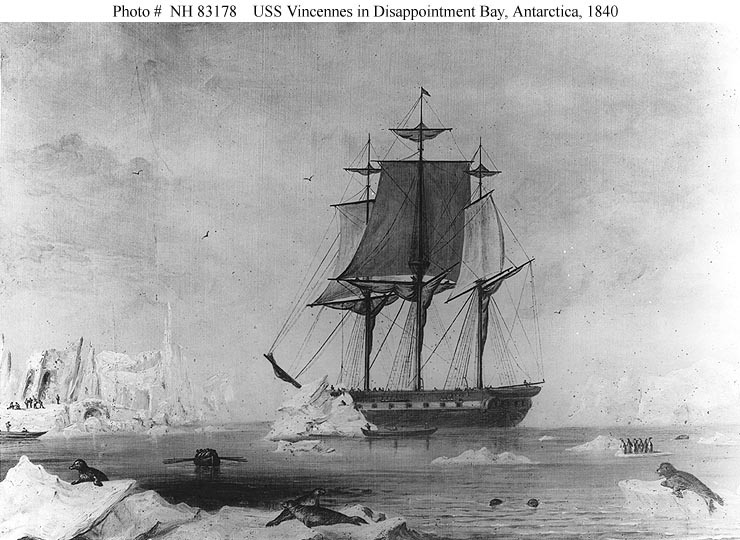 Courtesy of the U.S. Navy Art Collection, Washington, D.C. U.S. Naval Historical Center Photograph. 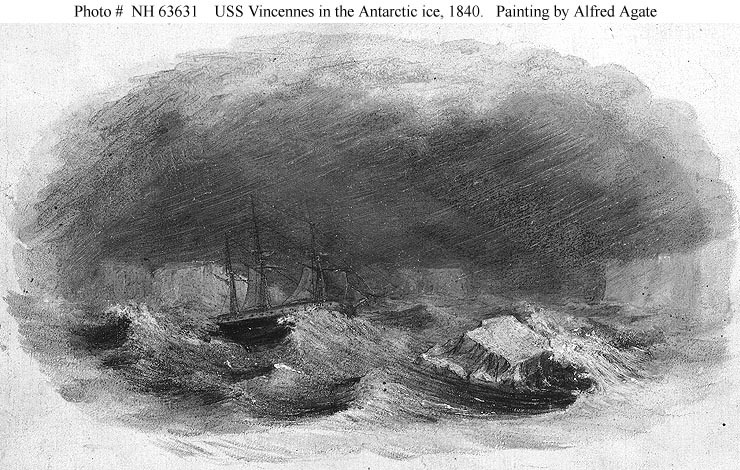 ↑USS Vincennes. Colored lithograph published by N. Currier, 2 Spruce Street, New York City, 1845. 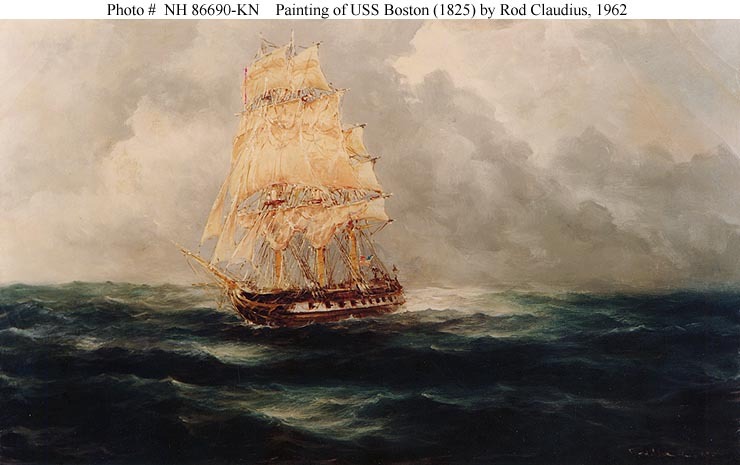 Courtesy of the Naval Art Collection, Washington, D.C. U.S. Naval Historical Center Photograph. ◎Pacific Sqn 1826-1830. 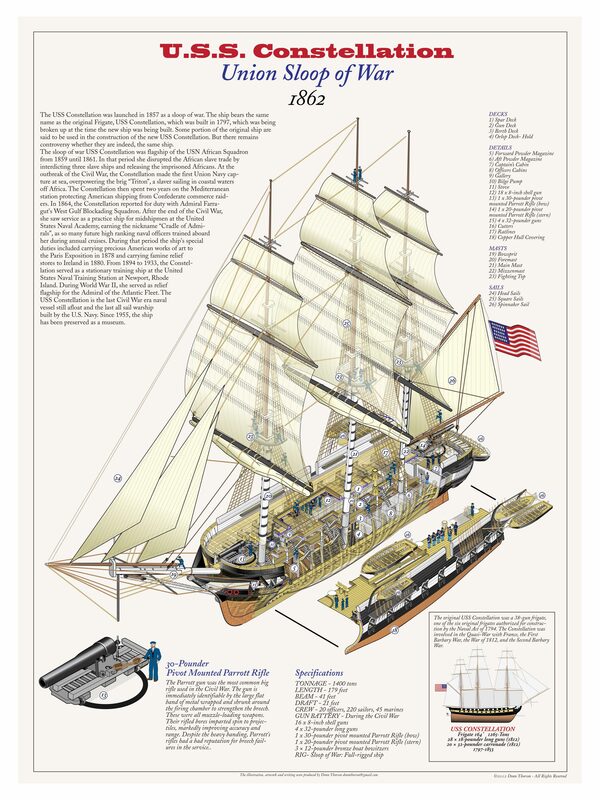 First U.S. naval vessel to circumnavigate the world, 1829-1830. West Indies 1831-1832. Pacific Sqn 1834-1836. 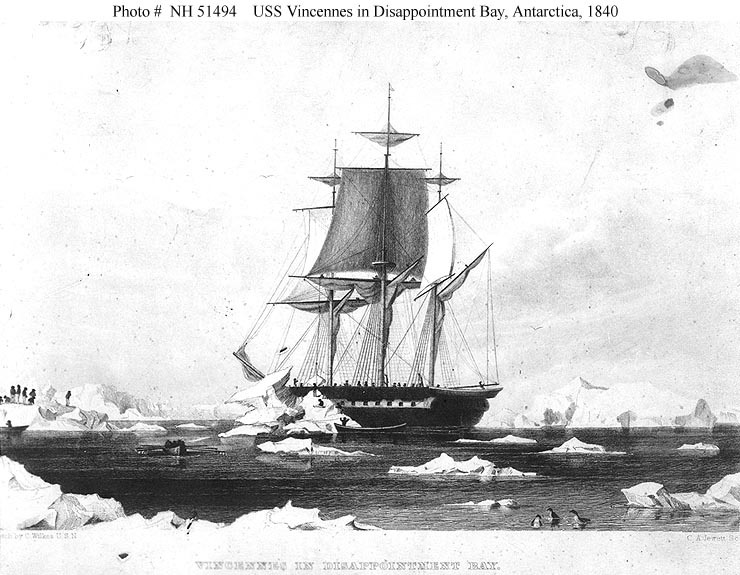 Wilkes survey expedition to South Seas, Aug 1838-Jul 1842 (1, 2, 3, 4). West Indies 1842-1844. Far East 1845-1847. 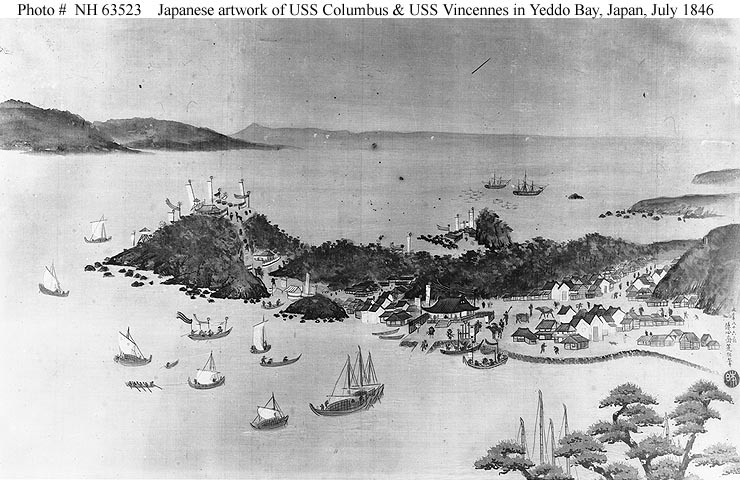 First visit to Japan, 20 Jul 1846 (1, 2, 3, 4). Pacific Sqn 1850-1852. 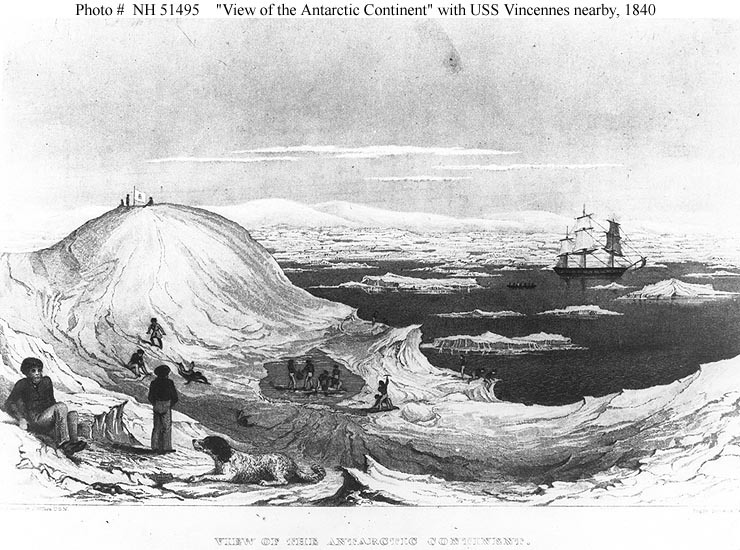 Ringgold's Far East expedition, 1853-1856. Africa Sqn 1857-1860. 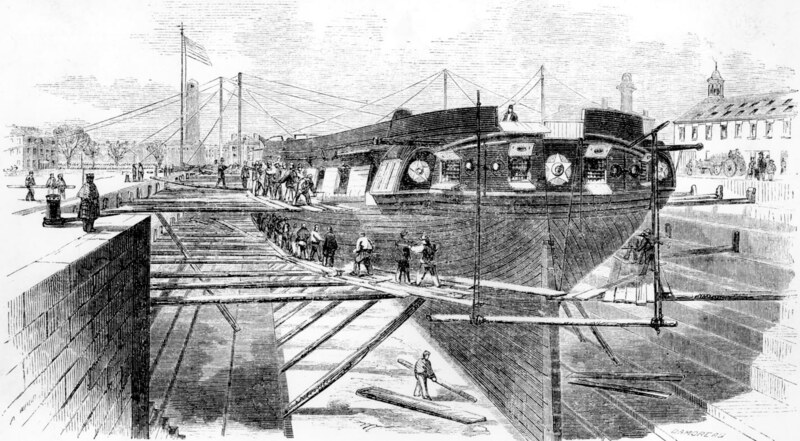 GukfBS 1861. Engagement with CSS Ivy at Head of Passes, La., 9 Oct, and with CSN squadron near Head of Passes, 12 Oct 1861. Guardship, Ship Island, Miss., 1862-1865. 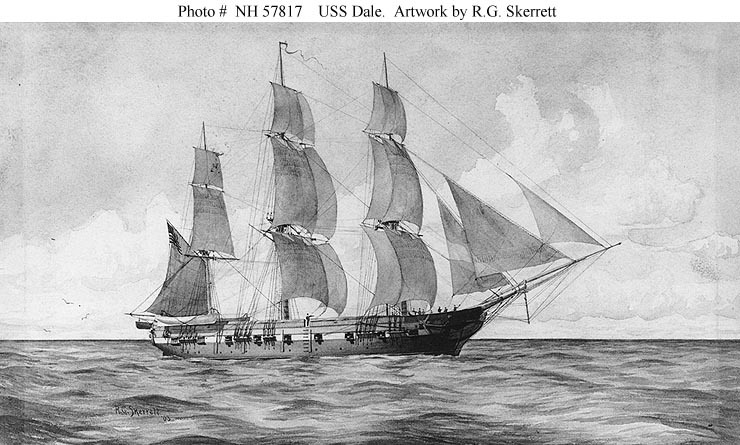 ↑USS Dale. Sepia wash drawing by R. G. Skerrett, 1903. Courtesy of the Navy Art Collection, Washington, DC. U.S. Naval Historical Center Photograph. ↑USS Decatur. 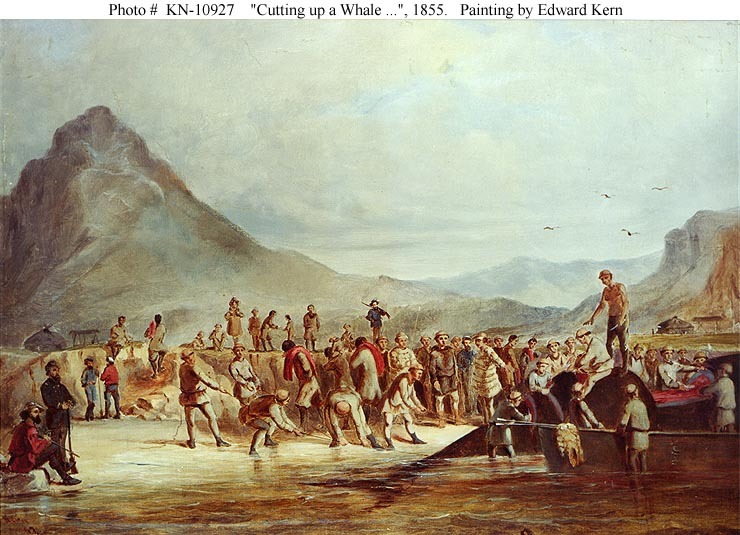 "Beating round 'Cape Freward': Straits of Magellan, Dec: 1854". Artwork, signed by "J.Y.T.". U.S. Naval Historical Center Photograph. 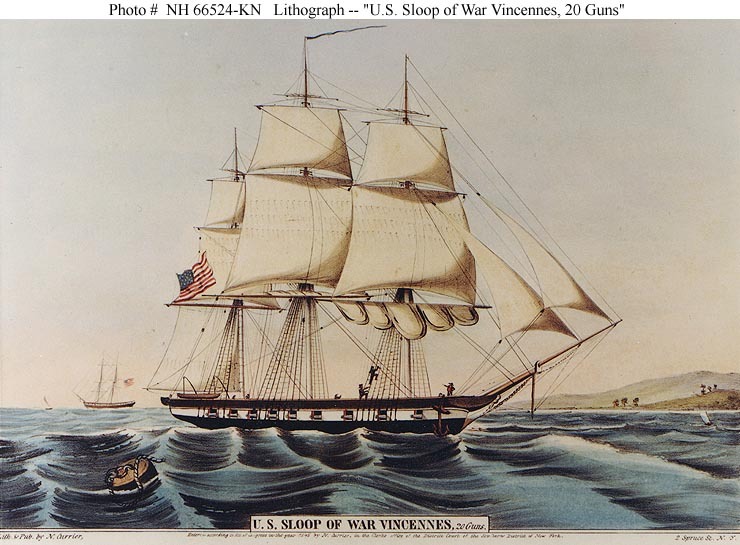 ↑The sailing sloop-of-war Saratoga, after the Civil War, in standard wooden-ship finish of the period. The apparent height of her weather-deck bulwarks is increased by the hammocks stowed along their top behind canvas screens. 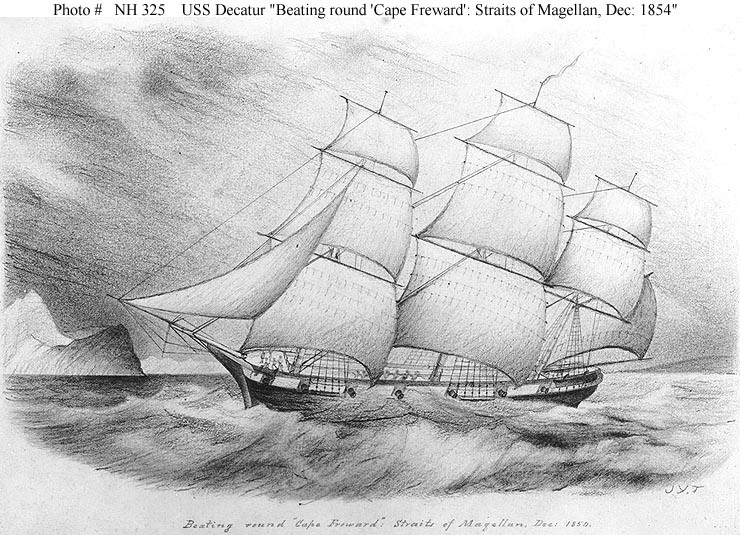 ◎Dismasted on first day of first cruise, 17 Mar 1843. Africa Sqn 1843-1844. Mexico 1845-1847. West Indies 1848-1849. East Indies Sqn 1850-1854. Expedition to Japan, 1853. Africa Sqn 1860-1861. ◎Mediterranean 1844-1846. Far East 1848-1851. 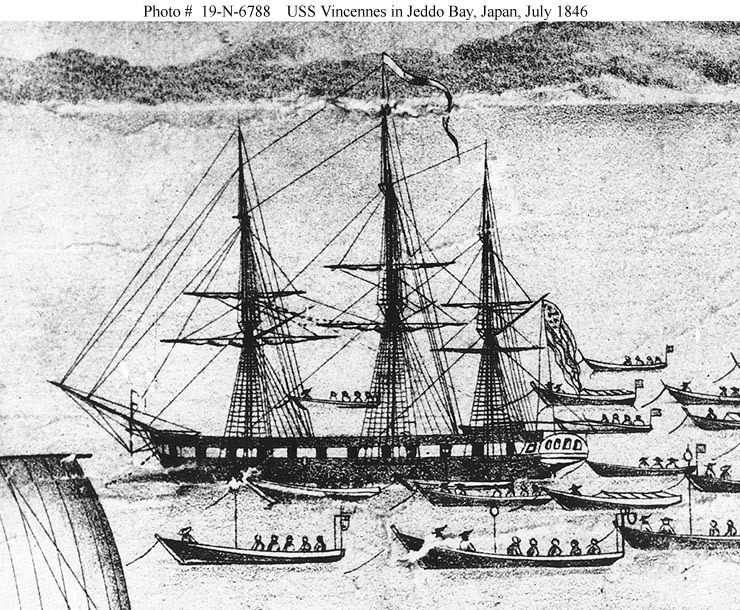 Expedition to Japan, 1853. 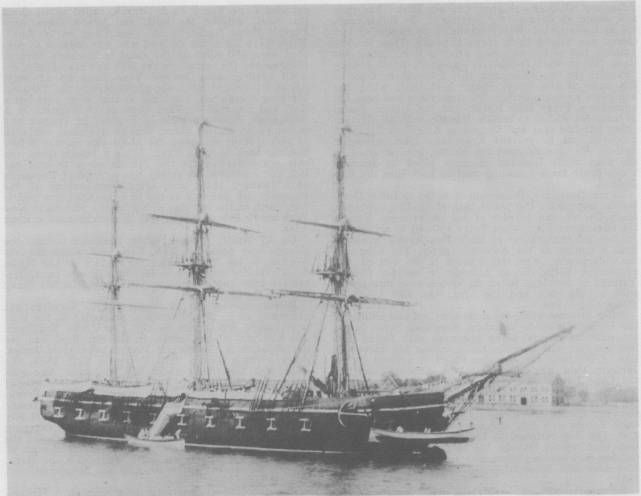 Training ship, 1855-1856, 1859-1860. ↑USS Jamestown, a Sloop of War built in 1844. ↑USS Constellation. Image by Donn Thorson. 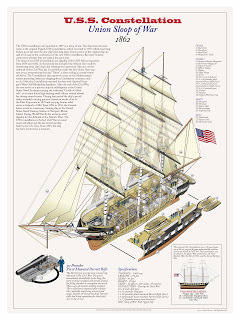 Image courtesy of Naval Analyses.